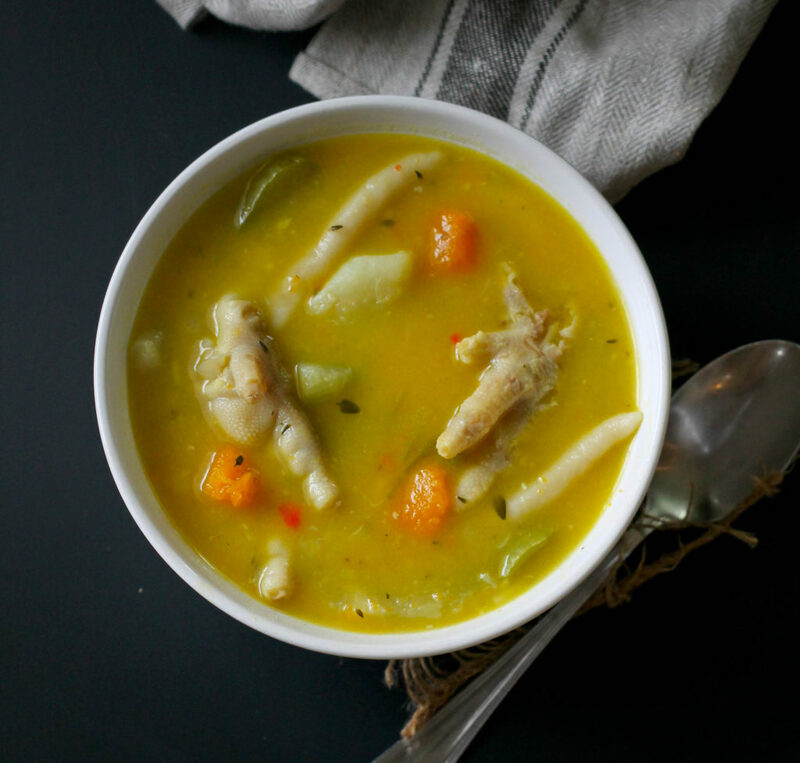 When my husband asked for Chicken Foot Soup he was very specific – he wanted his mother’s soup. I wasn’t offended, I’m a good cook but I know the connection between food and memories and nothing can compete with that. He clearly had fond memories of his mom’s soup so I called her up and asked how she made her chicken foot soup. I was glad that I decided to call her rather than make it on my own because my soup would have been a bit different and he would have been disappointed. She gave me clear instructions and I followed them, it’s safe to say this is her chicken foot soup recipe and not my own. 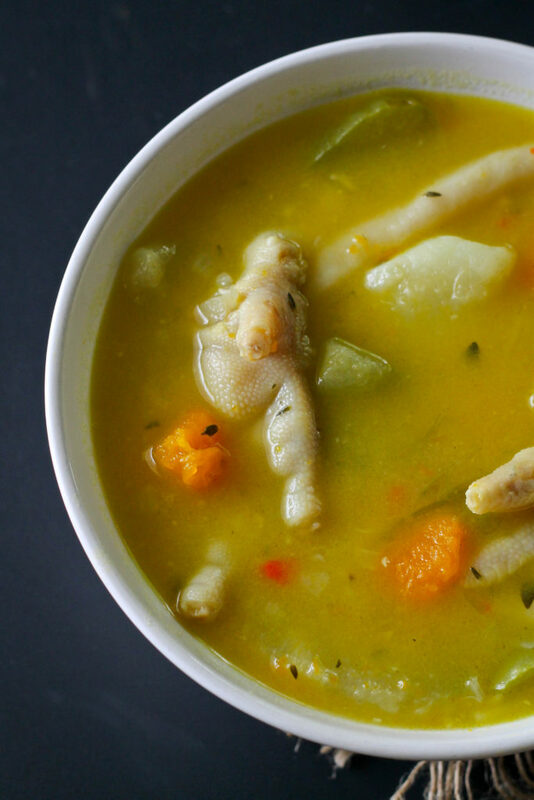 This chicken foot soup is a Jamaican version and is full of goodness. 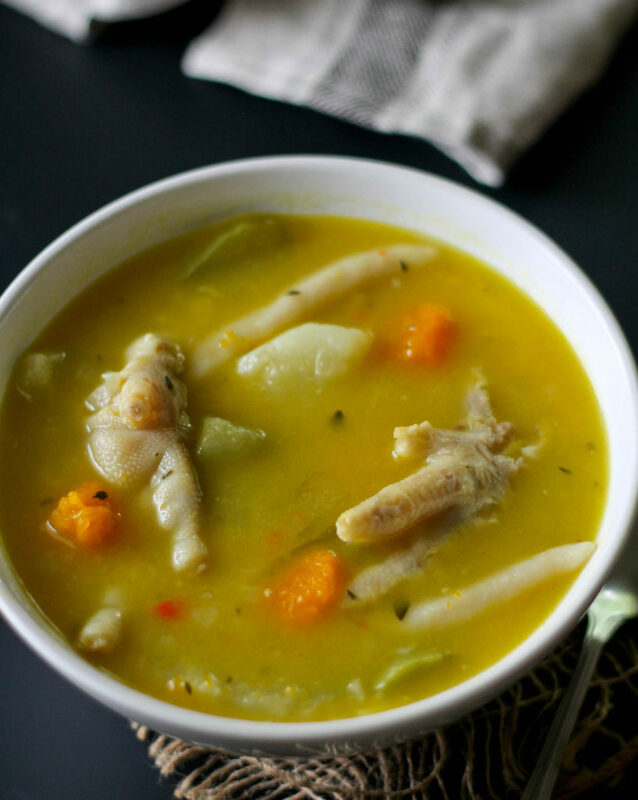 There’s chayote, pumpkin, potatoes and a savory chicken noodle soup; lots of garlic, thyme and pepper gives it a clearly Caribbean flavor and Jamaican spinners (firm dumplings) are the icing on the cake. I’m not a huge chicken foot fan and I enjoyed this soup! Place oil in a large pot, when oil is hot sauté thyme, pepper, garlic and thyme for just about a minute. Add chicken foot and cook for about 2 minutes. Add water and bring to a boil. Cook for 30 minutes then add chayote, potato, scallion, pumpkin, chicken soup mix and black pepper. Cover and let cook for about 10 minutes. To make spinners place flour, salt and water in a bowl and mix to form a stiff dough then pinch off small pieces of dough and roll between palms to form an elongated spinner. Add spinners to soup, then cook for an additional 10 minutes or until vegetables are soft.